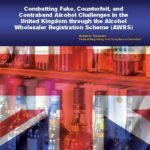 Alexandria, Va. – The Center for Alcohol Policy released a new report, “Combatting Fake, Counterfeit, and Contraband Alcohol Challenges in the United Kingdom through the Alcohol Wholesaler Registration Scheme (AWRS),” authored by Robert Tobiassen, the former Chief Counsel at the Treasury Department’s Alcohol Tax and Trade Bureau. The report is a follow up to his 2014 report, “The ‘Fake Alcohol’ Situation in the United States: The Impact of Culture, Market Economics, and the Current Regulatory Systems,” that examined the high number of incidences of fake alcohol in countries around the world, compared to the low number of incidences in the United States. The 2014 study found a large number of incidences of fake alcohol in the U.K., which is noteworthy as the major difference between the United States and U.K. is the structure of the alcohol regulatory system. Since the 2014 study, the U.K. has adopted the AWRS to combat fraud, tax evasion and fake alcohol. The adoption of the AWRS by the U.K. recognizes the importance of registered wholesalers in the alcohol industry and the increased accountability they provide to ensure the path for legitimate alcohol products. The 2017 report summarizes the processes and considerations for the adoption and implementation of the AWRS in the U.K. and examines the critical importance of a domestic distribution system as sound regulatory policy. Tobiassen explains the U.K.’s annual loss of approximately £1.2 billion ($1.5 billion) in excise duty as largely due to a “weaknesses in the distribution system,” now addressed by the AWRS. “The public evolution and formal adoption of the AWRS shows the importance of regulatory controls over the wholesale activity in the effort to combat fake, counterfeit, contraband and illicit alcohol,” concludes Tobiassen. In the report, Tobiassen suggests that as the U.K. refines and improves this new system, it “consider lessons from the United States’ experience in the distribution of alcohol,” especially the independence of suppliers, wholesalers and retailers in a three-tier system. Recent polling by the Center for Alcohol Policy highlights that public safety and concerns about proper alcohol regulation are most important to the American public. This includes 81 percent support for the required use of wholesalers. The Tobiassen report highlights the U.K. activities in the distribution of alcohol that serve as a contrast to the effective, accountable and working system of alcohol regulation in the United States.